Before surgery, your doctor will examine you thoroughly. He will ask you about your complaints and will do some diagnostic imaging. In general, this will be a magnetic resonance image (MRI), Fluoroscopy or sometimes also a computed tomography (CT) scan. A major advantage of the iLESSYS® method is that it can be carried out under local anesthesia and conscious sedation. However, your doctor will tell you what form of anesthesia will be best, in your individual case. A standard operation takes approximately 45 minutes. 3. Check to make sure the nerve is free again and remove the instruments. During the iLESSYS® surgery you will lay on the belly. Your doctor will make a small incision of a few millimeters on your back, directly over the spine and will create a channel to the site of the disc herniation. 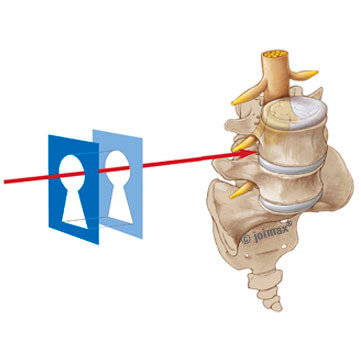 The “key-hole” will be created in a most tissue sparing way – trauma to bone or ligaments is minimized. Muscles and soft tissue will not be cut, only carefully dilated. 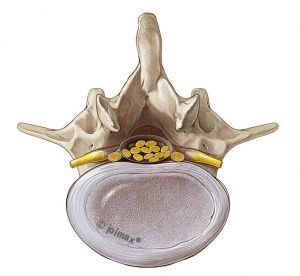 Through this “keyhole” from your back the tissue compromising the nerves can be removed. Your doctor will enter into this surgical field with a special endoscope. Using this laminoscope, he has a bright and sharp image of all structures within the spinal canal. 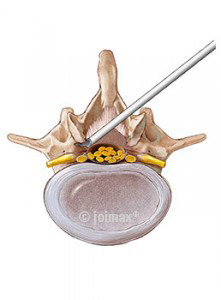 With special micro instruments, he will very carefully and specifically remove all material that compresses the nerve root. Finally, the surgeon checks whether the affected nerve fibres are free again. Only then, he removes all the instruments and closes the small incision with one or two stitches and a bandage. Usually, you will be free of pain immediately after surgery. After about two hours, you can get up again. Your doctor will tell you when you can go back home and return to your everyday life. the minimally invasive endoscopic approach allows the preservation of all stabilizing structures – ligaments, muscles and bones. The renowned U.S. research clinic “The Cleveland Clinic” calls attention to the endoscopic techniques offering significantly accelerated healing, compared to conventional methods.